Joe Dawborn took 3-31 for Cambs against Norfolk. 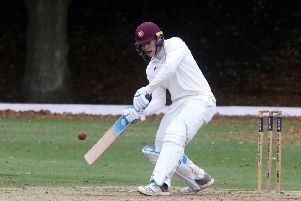 Cambs scored more runs that Norfolk in their opening Minor Counties Trophy match yesterday (April 24) and yet still lost the game at March Town CC. Twelve penalty runs imposed on Cambs’ slow over rate - it was Peterborough Town all-rounder Lewis Bruce’s first match in charge - proved costly as Norfolk emerged winners from a tense game by four runs. Those 12 runs took the total number of extras Cambs conceded to 55 in Norfolk’s 206-9. Peterborough Town’s Joe Dawborn claimed three early wickets on his way to figures of 3-31 in 10 overs, while Wisbech Town seamer Sam Rippington (3-30) also bowled well. Norfolk’s last pair added a crucial 34 runs. Cambs slumped to 13-3 before new professional Ben Smith’s 55 and 26 from Craig Park gave them hope. Peterborough Town’s Tim Young contributed 25 low down the order. Wicket-keeper Young had a decent day as he also claimed three catches. But Dawborn’s attempt to hit the last ball for six to win the game failed and Norfolk, who conceded a mighty 48 extras themselves, could celebrate victory. Cambs travel to Barrow to face Cumberland in their second group game on Sunday (May 1). Two teams qualify for the knockout stages from a five-team group. Norfolk 206-9 (L. Debmark 40, S. Rippington 3-30, J. Dawborn 3-31). Cambs 202 (B. Smith 55, C. Park 26, T. Young 25, G. Park 3-38).